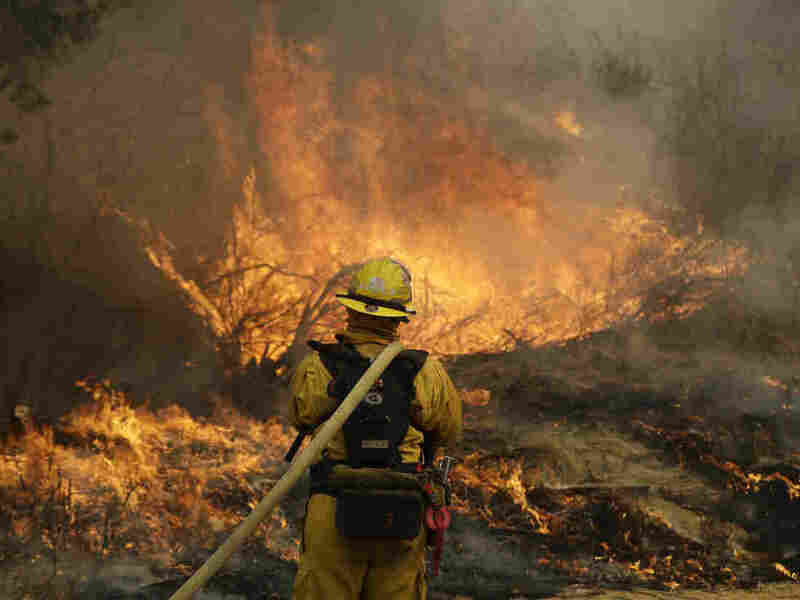 California Fire Officials Begin To Express Optimism About Battling Wildfires : The Two-Way Despite a rising death toll, authorities say "boots on the ground" are showing results in fighting the deadly wildfires. Fresno firefighter Peter Lopez holds a water hose as he monitors a backburn while fighting a wildfire in Glen Ellen, Calif.
For the first time since wind-aided flames ripped through Northern California nearly a week ago, local and state fire officials are expressing optimism that they are slowly gaining ground against what are now the deadliest wildfires in the state's history. More than a dozen fires are burning throughout Northern California. The death toll has reached at least 35, with 19 fatalities in Sonoma County, 8 in Mendocino, 4 in Yuba, and 4 in Napa. Authorities say the number of fatalities still could rise as a few hundred people remain officially unaccounted for. About 90,000 people have been evacuated from their homes and 5,700 homes have been destroyed. However, with at least 9,000 firefighters from around the country and some as far away as Canada and Australia, some officials say there is cause for hope. "We're making great progress across this entire fire, resources are coming in," said Napa County Fire Chief Barry Bierman, about the Atlas fire, which has threatened the eastern side of that wine-producing county. Bierman said the fire is about 27 percent contained, as of Friday afternoon. Bierman said that four separate and smaller fires on the western side of Napa County and in the neighboring Sonoma County have merged. It is now called the Nuns Fire. "The one benefit when fires merge into one is you don't have so much exterior perimeter to put out. Instead of a bunch of fires that need constant line around it, you have one line now that you put around it," he said. In nearby Sonoma County, officials say their "comfort level" is increasing, as ground crews have been able to cut containment lines with bulldozers and back fires. The Tubbs Fire, which has laid waste to a big part of Sonoma County, is now 25 percent contained as of Friday afternoon. "We're making a lot better progress today," said Steve Crawford, the Cal Fire operations chief for the Tubbs fire. "We told the guys, 'Get the boots on the ground. Do hard work today and by this evening when this wind comes up, hopefully we'll be ahead of the power curve.'" The main concern throughout the region is the high wind with low humidity forecast to kick up late Friday and early Saturday morning. "We are concerned about red flag warnings. We've had various reports of winds that could exceed 40 miles an hour. We've challenged the troops to get out there and mainly secure the south parts of these fires in preparation of those strong north winds," said CalFire Unified Incident Commander Brad Gouvea. But the danger is far from over and authorities are pleading with evacuees to heed warnings not to return to burned out areas yet. The hardest hit municipality is Santa Rosa, a city of 175,000 residents in Sonoma County. Mayor Chris Coursey said that his city has lost more than 5 percent of its housing stock, or about 3,500 homes. "It's a huge hill that we have to climb," said Coursey at a Friday afternoon news conference. Authorities in Napa have yet to release figures on the number of evacuees or damaged or destroyed structures in that county.